Taste test: These are regular cheese puffs that look exactly like every other cheese puff in the world, with lots of nuclear orange powder on them. When you bite into one, however, the taste of honey overpowers the taste of cheese. It's a pretty awesome taste, and you almost forget that there's cheese in that powder too! 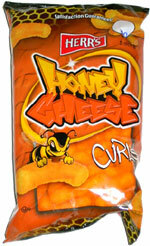 Herr's has done a great job with this snack, this is definitely a winner. 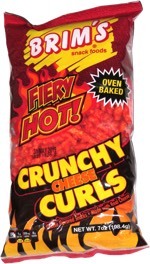 Maybe they can replicate this flavor on other snack form factors, such as potato chips or tortilla chips. Smell test: Typical cheese curl aroma, no honey smell noticed.